MEXICO CITY (CNS) — Pope Francis demanded forceful denunciations of drug violence in Mexico from the country’s bishops, who have preferred timid pronouncements instead of speaking prophetically on a tragedy that has claimed more than 100,000 lives over the past 10 years and left another 25,000 Mexicans missing. The pope spoke to the Mexican bishops for more than 40 minutes, delivering a tough talk on matters the pope plans to highlight in his six-day Mexican trip, including violence, migrants and indigenous issues. In off-the-cuff remarks, he warned of “the temptation of aloofness and clericalism” for bishops, called for clerical transparency and asked for unity in the Mexican bishops’ conference, which has pursued closer ties with political leaders in recent years, while speaking softly — if at all — on uncomfortable issues such as corruption. The violence has claimed the lives more than a dozen priests over the past five years, while some dioceses have been accused to collecting “narcolimosnas” or “drug alms,” and drug bosses — who often consider themselves proper Catholics — construct and fix parishes and sponsor patron saint feast days. “I am particularly concerned about those many persons who, seduced by the empty power of the world, praise illusions and embrace their macabre symbols to commercialize death in exchange for money which, in the end, ‘moth and rust consume,'” he said. Pope Francis plans to celebrate Mass a stone’s throw from the U.S. border in Ciudad Juarez Feb. 17, when he is expected to expand on the migrant issue. The pope travels to Chiapas at the other end of the country Feb. 15 for a Mass with Mexico’s indigenous peoples, who have fallen away from the church in droves. 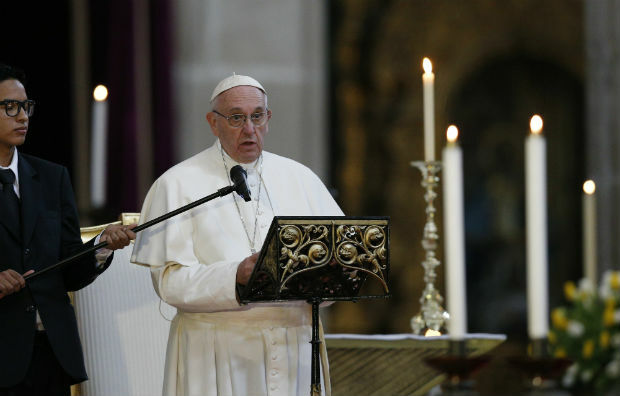 He urged the bishops to build a church more inclusive for indigenous peoples, who often live in impoverished conditions and in communities where Spanish is seldom spoken.